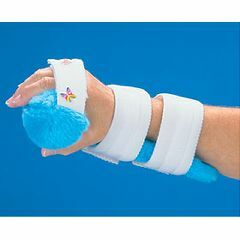 Pucci Air-T Hand/ Wrist Orthosis reduces wrist flexion and finger flexion contracture, and positions the thumb in opposition. Shell is made of dipped flexible metal that can be adjusted manually. Offers better control of thumb placement. The inflatable hand/thumb component attaches to the orthosis. Once in place, it is gradually inflated to lift the fingers away from the palm and holds the thumb in full opposition. Kit includes one soft fabric cover, laundry bag and hand bulb inflator. One size.